Fridge0 Refrigeration provides you with same day service with no call out fee! Our fully qualified technician repairs and services all Amana models throughout the Eastern and South Eastern suburbs of Melbourne. 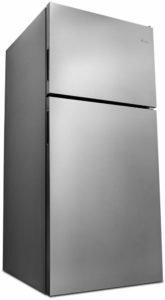 Amana refrigerators are generally the top end of the market and have built themselves a good solid reputation. Their designs are generally simple and robust resulting in customers being quite pleased due to not having to worry about continuous repairs. Amana have all the known designs but most popular are the side by side models followed by the French door and bottom mount. Amana has a great range of models, some with electronics and others without. Usually the none electronic models have fewer issues when it comes to breakdowns due to the obvious factor that the design has been kept simple. Most common issue is the heating element located inside the freezer. This component usually fails around the 10 year mark and needs to be replaced. The refrigerator starts tripping the safety switch on the main switch board of the house. To confirm that it is the refrigerator that is causing the circuit breaker to trip, one has to unplug the refrigerator from the wall socket and then reset the circuit breaker. If the circuit breaker stays reset then it is your refrigerator that is faulty. If the circuit breaker cannot be reset and keeps on flicking off as soon as you try to reset it, then it is some other appliance in the house or possibly the circuit breaker switch itself. When the heating element fails it doesn’t always mean that it will start tripping the circuit breaker, it can just stop working. When this occurs the first symptom will be that the refrigerator compartment stops cooling or the milk doesn’t last as long as it normally does. The second symptom will be the inside of the freezer compartment back wall starting to form ice or snow because the heater has failed and therefore doesn’t defrost anymore and just builds ice. You will also notice that the top part of the freezer section isn’t as cooled as it should be and food products such as ice cream will start going soft. The Amana side by side refrigerators has a blocked drain. This happens usually after about 10 years and is due to the design of the drain and/or certain materials which are used as insulators break away or melt from they’re original position and end up in the drain tube. Only a partial blockage will cause the drain to block up with ice and start causing issues. Although this problem doesn’t affect the function of the refrigerator, it will cause water to leak out from the front freezer door of the refrigerator usually every 4 to 6 hours. The reason why it will do this in that time bracket is because that is when the refrigerator does its defrost cycle melting the ice from the evaporator coil. So, instead of going down the drain it ends up going from the front and can cause substantial damage if left unchecked. To resolve this issue, the back cover inside the freezer needs to be removed, all the ice needs to be removed and the tube that is located at the back of the refrigerator next to the compressor needs to be removed, checked and cleaned. The compressor relay which after about 10 to 15 years ends up failing by burning out. This sometimes gets miss diagnosed as a faulty compressor but usually isn’t the case. The compressors used in these models are extremely robust and rarely fail. The symptom of this failure is a louder then usual hum for a few seconds followed by a distinctive click noise and then silence for 3 minutes. If this occurs it is highly recommended to switch the refrigerator off at the wall socket and call a qualified technician to diagnose the fault correctly. If left unchecked it is very possible it will damage the compressor. With the more recent electronic Amana models the designs are more complicated and are harder to diagnose. The most common components that fail is the main electronic board followed by the heating element.